Therapy at the University of Puget Sound on April 9, 2013 at the University of Washington Medical Center. For people with spinal cord injuries (SCI), having the right wheelchair is critically important for independence and health. How do you make the right decisions about this expensive, vital piece of equipment? Our speaker, Jennifer Hastings, PhD, PT, is a nationally respected provider, researcher, and educator in wheelchair seating for people with SCI. 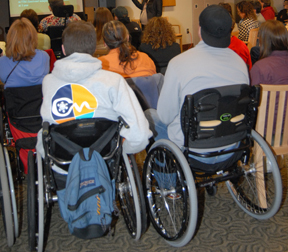 She discusses the principles of seating for maintaining optimal health after spinal cord injury, the relationship between seating and skin health, and how and when pressure mapping may be useful.She also provides resources for finding a wheelchair seating expert. Find a physical therapist (PT): go to http://www.moveforwardpt.com, click on “Find a PT” and select “Neurological” under practice area. 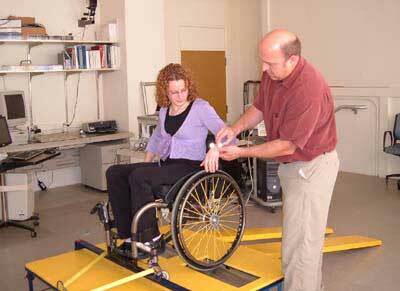 Read their profiles to find out if they have training in wheelchair fitting. 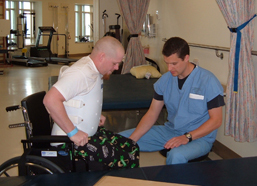 Find an occupational therapist (OT): available through spinal injury centers and most rehabilitation hospitals, medical centers, and clinics. Ask your Durable Medical vendor for recommendations.